After leading the Majors with eight stolen bases and tying for the Big League lead in hits, Cameron Maybin was named National League co-Player of the Week for July 18-24, sharing the honor with Diamondbacks outfielder Justin Upton. Maybin notched 14 hits and hit .538 (14-for-26) while scoring eight runs. As part of the monster week, he tallied his third four-hit game of the season on July 21, the most by any center field in the Majors. Additionally, Maybin broke a franchise record by stealing at least one base in each of his last six games, breaking the previous mark of five set by Dave Roberts (2006) and Allan Wiggins (1983). Over the six-game stretch, Maybin has swiped a total of eight bags, becoming the second Padre crack the 20-steal plateau this year (also Jason Bartlett). 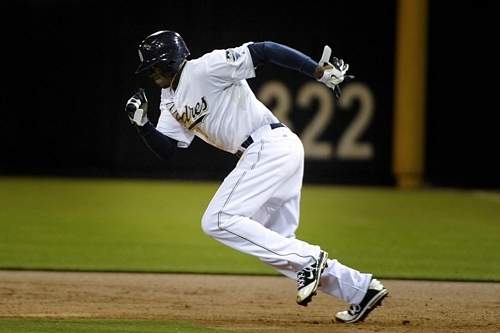 2011 marks the first season since 2006 that the Padres have had more than one player reach the 20-steak mark. It was accomplished by Roberts, Mike Cameron and Josh Barfield that year. The club has not had four players reach 20-steals since 1999. Will Venable currently has 18 stolen bases and Orlando Hudson has 13.